What Makes Oshawa So Special? December 20, 2018 December 19, 2018 No Comments on What Makes Oshawa So Special? Most mills and factories close with a whimper and not a bang. Few were therefore prepared for the media fire-storm sparked by General Motor’s (GM) decision to close its auto-assembly plant in Oshawa, putting 2,500 Canadians out of work. What makes this closure so special? For starters, there is the historic centrality of the auto industry in Southern Ontario. The auto makers have provided generations of Canadians with work and wages that have allowed working-class people to achieve a middle-class standard of living. For more than a century, Oshawa was synonymous with the auto industry. But this is not why Oshawa is so newsworthy right now. What is fueling public anger is the fact that GM was bailed out by the Canadian and US governments in 2009. Canadians pumped 10.5$ billion into GM, losing more than $3 billion in the process. 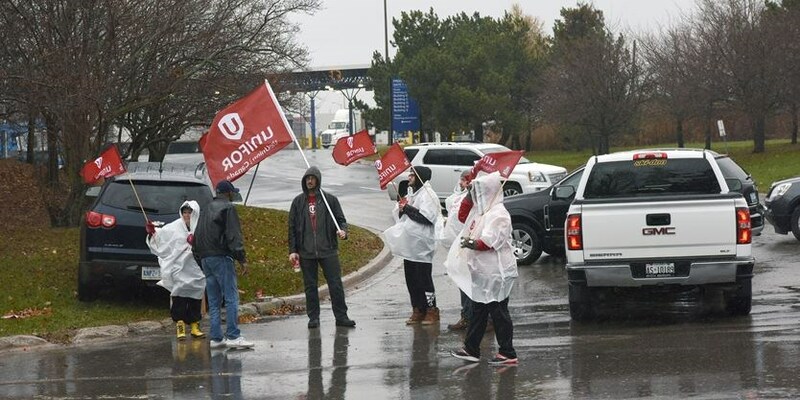 And, in exchange for a no-closure promise, UNIFOR offered concessions, including the acceptance of two-tier compensation. Nine years later GM announced it would close the Oshawa plant anyways. General Motors used to be a major employer in Canada. But that was before GM closed its plants in Scarborough (1993), Ste-Thérèse, Quebec (2004), the Oshawa truck plant (2008), Windsor (2010), and now – unless we change GM’s mind – the Oshawa car plant. Only the CAMI/GM assembly plant in Ingersoll remains, with an engine plant in St. Catharines. The Oshawa plant closing is what we call a slow-death closing. GM employed 23,000 in Oshawa in the early 1980s, ending with just 2,500. Before you blame automation, it is important to note that the number of cars produced per year there dropped from 1 million in 2003 to just 118,000 today. Another big reason why the Oshawa plant closing is newsworthy is that we are living in a time of working-class anger and revolt. Those “left behind” in deindustrialized areas have contributed to Brexit, the election of Donald Trump as US President, and the rise of right-wing populism in Europe. The 2016 US Presidential election is a case in point. The Rust Belt 5, comprising the deindustrializing states of Pennsylvania, Ohio, Wisconsin, Michigan and Iowa, voted for Obama twice only to flip to Trump, propelling him into the White House. Many deindustrialized areas saw a massive 20% swing towards the Republicans. There is a festering sense of betrayal in working-class communities. These are polarizing times. We have to break with the idea that we live in a deindustrialized world. We don’t. Every thing around us is built somewhere. The real question is who is going to build these things and how much will they be paid? In the vast majority of cases, plant closings are the result of corporations deciding to invest somewhere else. Some say that the Oshawa closure was necessary because of the urgent need to move to environmentally-friendly cars. This is a red-herring. The Oshawa plant could have produced the next generation of cars, but GM decided to invest in low wage China and Mexico instead. It is important to remind ourselves that the Oshawa announcement was not inevitable. GM would not have been allowed to shut its Oshawa plant before 1988 under the old Auto Pact, as the Big 3 automakers had to produce as many cars as they sold in Canada. We traded away these protections with free trade, just as we are slowly trading away our dairy farmers today. Then there was the Chrysler Bailout of 1980. When the company came begging, Canada agreed only on the condition that it reinvest hundreds of millions in Canadian manufacturing. As a result, when plants were closing south of the border (Detroit lost 180,000 manufacturing jobs in a short 7-year period), Southern Ontario was re-industrializing. Incredibly, the 2009 bailout of GM had few strings attached. We then quietly sold off Canada’s GM shares in 2015, losing what little leverage we had. It represents a failure in leadership, nothing less. We need to do trade deals differently. Trump ostensibly tore up the old NAFTA agreement because it failed the American worker. The new agreement, just signed, has a provision that 40% of the content of cars manufactured in North America must be built by workers earning at least $16 per hour. This is an improvement, but is it enough? Clearly not, as the GM closures prove. The new NAFTA still allows 60% of North American cars to be built in low wage Mexico. We can and must do more. In the 1970s, we nationalized Canada’s failing aeronautics industry – saving thousands of jobs at de Havilland in Toronto and Canadair in Toronto. There are sometimes alternatives. Ask yourself this, why is Donald Trump doing more for industrial workers than Justin Trudeau? Steven High is professor of history at Concordia University. He is the author of a number of books and articles on deindustrialization in Canada and the United States, including One Job Town: Work, Belonging and Betrayal in Northern Ontario and with Lachlan MacKinnon and Andrew Perchard, The Deindustrialized World: Confronting Ruination in Post-Industrial Places.